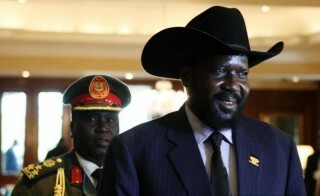 South Sudan’s president Salva Kiir. AFRICANGLOBE – There is an avalanche of support for the great decision taken by the government and people of South Sudan to stop theft of their oil wealth by the grand children of slave traders by closing the pipeline which the NCP leaders thought without it the South Sudan would crumble economically. The applause is both expressed by South Sudanese in the ten states and by those in the Diaspora. The support is only in comparison with the overwhelming victory witnessed in the referendum voting in January, 2011 for the independence of republic of South Sudan. The citizens appreciate the position of their government because it has been tolerant for so long making the NCP leaders to believe that this was a sign of weakness and therefore to widen their theft and utterances as if there was nobody on earth who could stand up to challenge them. After all war criminals like Al Bashir had been threatening to close the pipeline and giving ultimatum to South Sudan as if it was still its province ignoring to treat it as a sovereign nation. Now after South Sudan’s Council of Ministers under the shrewd guidance of President Salva Kiir had taken the historic decision why should the second Vice President of Sudan Al Haj Adam Youssef cry foul before even feeling the bite of the aftermath of the pipeline closure? As for the few South Sudanese who still think that the grand children of the slave trading Arabs are better allies than our fellow Africans who stood with us during the dark days of liberation and therefore even if the Arabs are thieves we have to accommodate them these are the third group of Southerners who are known as opportunists and are the 0.073% who voted for unity during the referendum. Some of these misguided fellows express fear of economic stagnation resulting from the closure of the pipeline because they are obsessed by the propaganda of NCP stalwarts that the South cannot stand without oil. Yet these very Arabs traitors know very well that the South surpassed the rest of the Sudan in natural resources: its soils, forests, mountains which possess rock for cement and other minerals, its livestock, its fishery especially in the Jonglei region, its gold, its fresh water, its agricultural potentials, and several others the successive Arab minority governments in Khartoum kept undeveloped to discourage South Sudanese from separation so that they could be supplied with food items from Al Gezira scheme. Even washing soap was brought into South Sudan from the north. Now it is the time for South Sudanese to exploit their own resources and benefit themselves and their neighbours who live with them peacefully. The message to the half-hearted supporters of the NCP and their expression of pessimism about the closure of the pipeline is that they should wait and see if South Sudan would succumb economically. They should know that the struggle in the bush during two civil wars (1955-72) and (1983-2005) was not only for political independence but for economic freedom as well. You cannot have a government shouting at you, stealing what belongs to you and you bear its insults and above all its offence in form of theft. It was we South Sudanese who had coined the slogan “enough is enough” and for how long do you the insignificant minority elements want Sudan to milk our wealth? Some of these misguided elements even question the guarantee of the honesty of the countries or country through which we want our pipeline to pass through to the Indian Ocean as if the Arabs of the Sudan could elevate their fourth class status to the third or even second. Those countries through which the pipeline would pass through are Africans and that was why they could not stomach discriminating and killing of South Sudanese by the Arabs and shared whatever little they had with our people. So the pipeline would pass through safe countries not Sudan where there are NCP camels with wide opened mouths waiting to swallow our wealth. Let all South Sudanese including political parties support the decision of the government. In the histories of nations of the world great decisions taken by ruling parties and great leaders have often been acclaimed by opposition parties because such decisions are for the good and welfare of all. In America, the Democratic Party never opposed the decision for war on Iraq taken by the ruling Republican Party.